Mythological Ponderings: The Government's EU Leaflet Dissected. "On Thursday, 23rd June there will be a referendum. It's your opportunity to decide if the UK remains in the European Union (EU). It's a big decision. One that will affect you, your family and your children for decades to come. 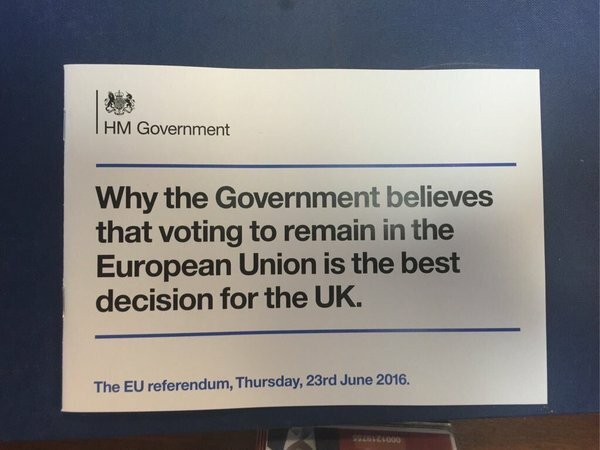 The Government believes the UK should remain in the EU. If you would like further information, please visit the Government's EU referendum website at EUReferendum.gov.uk"
It starts off well, each of the 4 opening sentences are entirely factually accurate. Sentence 5 however is where it starts to fall down. The myth of the UK's 'special status in a reformed EU' is presumably based on Cameron's renegotiation, though it's curious that this renegotiation isn't mentioned specifically anywhere within this leaflet. Cameron's renegotiation goal was pitiful in scope, and the PM achieved even less than that. What meagre reforms he did manage to get an agreement on, have yet to come into effect and - despite lying to parliament about it - are not legally binding. The UK not joining the euro is a given. That's an option that we've had since the Maastricht Treaty in 1992, and despite some Europhiles thinking, inexplicably, that it would still be in our long term interests to join at some point, a political party's chances of getting the support of the electorate with that on their manifesto are akin to a cat's chances on the River Styx. We do indeed keep our border controls, but this in no way exempts us from the freedom of movement that is a necessary part of our EU membership. It's technically true, but is clever wording, omits the fact we're still subject to freedom of movement laws, and is pure spin. A reoccurring theme throughout this pamphlet. I'm not entirely sure what the claim that the UK will not be part of further integration is based on. Again, it could be alluding to Cameron's claim to have secured an opt-out of 'ever closer union' during his renegotiation, but as these 'reforms' are not legally binding, and amount to nothing more than the tweaking of some wording anyway, it's an entirely fatuous claim. Similarly the 'tough new restrictions' on migrant welfare claims are dependant on the sham renegotiations, and the commitment to reduce red tape is something the EU has been saying it will do for years and yet hasn't managed to do so. The claim that this leaflet sets out the facts is as accurate as a claim, were it to make one, that it is in fact a banana. "The EU is by far the UK's biggest trading partner. EU countries buy 44% of everything we sell abroad, from cars to insurance. Remaining inside the EU guarantees our full access to it's single market. By contrast, leaving creates uncertainty and risk. The EU's Single Market has over 500 million customers and an economy over five times bigger than the UK's. The Single Market makes it easier and cheaper for UK companies t sell their products outside the UK, creating jobs as a result. Being inside the EU also makes it more attractive for companies to invest in the UK, meaning more jobs. Over the last decade, foreign companies have invested £540 billion in the UK, equivalent to £148 million every day." This section, like every argument about the economy when it comes to our EU membership, wrongly conflates that membership with access to the Single Market. It is not necessary to be a member of the EU in order to have access to that market, which runs from non-EU Iceland to non-EU Turkey, encompassing every European country bar Belarus and Russia. It's true that 44% of our exports go to the EU. It's also true that ten years ago this was 55%. Our exports to the EU are declining whilst our exports to the rest of the world are growing, though of course the leaflet neglects to mention this fact. This is precisely why, in a time when globalisation is only increasing, we should leave the EU and rejoin the top tables of world trade. Shackled as we are to the EU's declining share of global commerce, we cannot fully engage on the world stage where our economic growth will come from. I've already expanded on this point in a previous post. Maintaining access to the Single Market whilst freeing ourselves up to pursue trade agreements elsewhere means that that £540 billion of foreign investment could increase exponentially. This is why I, and many others, advocate the EEA via EFTA exit route, genuinely affording us the best of both worlds. Losing our full access to the EU's Single Market would make exporting to Europe harder and increase costs. From next year, mobile phone roaming charges will be abolished across the EU, saving UK customers up to 38p per minute on calls. Some argue little would change if we left the EU. But there are no guarantees UK customers would keep these benefits if we left." Once again, the leaflet conflates EU membership with access to the single market, leaving the EU using the Norway model as an interim measure negates any possibility of economic shock. Though were there a weakening of the pound this would make UK exports more attractive thus somewhat negating the 'harder to trade outside' argument. As for the higher prices of household items, this is pure speculation again. What isn't speculation is that, thanks to the Common Agricultural Policy, food prices within the EU are roughly 17% higher than they otherwise would be under market conditions. The EU is not just a free trade area but a protectionist customs union. The high tariffs it places on imports from outside the market, keep African farmers (for example) from exporting their produce to Europe at a competitive rate, keeping them impoverished and our food prices higher. It's true that the EU has made it easier to travel between the continent's various nations, though there is no need to be in political union in order to achieve this. Visa-free arrangements between nations have existed for far longer than the EU has and there is no reason why, outside the EU, we could not seek similar arrangements with our allies across the world. Some have even speculated on a free trade area with free movement in the Anglosphere. The reduction in flight costs across the continent is down to the Single European Sky initiative, which includes the 28 EU nations as well as non-EU members such as Norway and Switzerland, and is also observed by other nations such as Egypt, Tunisia and Albania. The suggestion that leaving the EU means a hike in air fare then, is nonsense. As I discussed in an earlier blog post, the removal of mobile roaming charges is down to global initiatives instigated by the International Telephone Users Group and the OECD, not the EU. Far from an argument for continued EU membership, the fact that such regulations are being increasingly made at a global level indicates the importance of our leaving in order to shape these regulations at the top tables before they are implemented by the EU. Furthermore, these being global regulations means that these benefits are indeed guaranteed in the event of a Leave vote. The European Health Insurance card actually doesn't offer as many benefits as traditional travel insurance, and anyone who has been on holiday to a non-EU country knows that getting such insurance isn't quite as taxing as performing cranial surgery. Though once again, the EEA/EFTA option keeps this benefit in place. Page 4 - What happens if we leave? "Voting to leave the EU would create years of uncertainty and potential economic disruption. This would reduce investment and cost jobs. The Government judges it could result in 10 years or more of uncertainty as the UK unpicks our relationship with the EU and renegotiates new arrangements with the EU and over 50 other countries around the world. Some argue that we could strike a good deal quickly with the EU because they want to keep access to our market. But the Government's judgement is that it would be much harder than that - less than 8% of EU exports come to the UK while 44% of UK exports go to the EU. A more limited trade deal with the EU would give the UK less access to the Single Market than we have now - including for services, which make up almost 80% of the UK economy. For example, Canada's deal with the EU will give limited access for services, it has so far been seven years in the making and is still not in force." As I've already stated, leaving the EU via the EFTA/EEA route eliminates any uncertainty and 'potential' economic disruption. Though it's worth mentioning that Article 50 of the Lisbon Treaty states that any member state leaving the union enters a period of negotiation lasting two years. So where the Government has pulled the '10 years (of uncertainty) or more' from I confess I haven't the foggiest of ideas. Any negotiations post-Brexit would need to be completed as quickly as possible to minimise any economic disruption, both to the UK and to the EU. The eurozone is still pretty much stagnant, whilst the UK economy is growing so both sides will be keen to minimise any economic disruption caused by Brexit. This incidentally, is another argument in favour of the Flexcit model. The leaflet tries to downplay the importance of the UK to the European economy by contrasting the 44% of UK exports (down from 55% a decade ago you'll recall) to the 8% of EU exports to the UK. That 8% that the Government so summarily dismisses is equivalent to somewhere in the region of £60 billion a year. With Greece crippled and in danger of losing it's debt relief, and Italy on it's knees, the EU cannot afford to take a hit of that size by engaging in a trade war with a post-Brexit UK. Both sides will want to secure trade arrangements quickly, regardless of the figures involved. The text in bold is an attempt to refute the so-called 'Norway option' that I've advocated elsewhere in this post, however it is again misleading due to it's omission of crucial information. The claim of having no say over the rules of the single market in this instance is entirely false. Norway does in fact have input into the rules and regulations of the EEA, but this is increasingly inconsequential. EU regulations are increasingly decided by global trading bodies that Norway has access to. The UK is subject to EU collectivism at these top tables of global trade and so ultimately has less say over the rules. There is an emerging global Single Market in which the EU is an increasingly redundant middleman. We should be taking a lead role in the formation of these regulations, not having our influence undermined by the EU. Of course, it's worth mentioning that Norway actually only adopts 9% of EU legislation, according to the EFTA Secretariat. For non-EU, single market accessing Switzerland it's precisely 0%. They have to abide by those regulations when exporting to the EU of course, just as they must abide by Indian regulations when exporting to India, yet not having a say over those rules doesn't stop it being the Swiss' second largest export market after Germany. Norway does not, as the leaflet claims, 'pay into the EU'. It does participate in various EU schemes voluntarily which it pays into, as any intergovernmental scheme would require. However, this is more likely a false conflation of the EEA grants to which Norway is a party, with the UK's own EU membership fee. This money does not go to the EU. You can read more about it here. Finally on this section, the Government implies that there is a Single Market for services, which there isn't, and then goes on to say that Canada's deal with the EU has limited access for services despite not yet being in effect after seven years of negotiations. Why the failure to secure a comprehensive trade agreement after seven years is an argument for EU membership I haven't the faintest idea. The UK is not part of the EU's border-free zone - we control our own borders which gives us the right to check everyone, including EU nationals, arriving from continental Europe. The Government has negotiated a deal that will make our benefits system less of a draw for EU citizens. In future, new EU migrants will not have full access to certain benefits until they have worked here for up to four years. The Government will have greater powers to take action where there is abuse of our immigration system. Some argue that leaving the EU would give us more freedom to limit immigration. But in return for the economic benefits of access to the EU's Single Market, non-EU countries - such as Norway - have had to accept the right of all EU citizens to live and work in their country. EU membership means UK police can use law enforcement intelligence from 27 EU countries, and will have access to fingerprint and DNA information. EU cooperation makes it easier to keep criminals and terrorists out of the UK. Since 2004, using the European Arrest Warrant, over 1,000 suspects have faced justice in UK courts and over 7,000 have been extradited." Again the Government asserts that we control our own borders meaning we have the right to check everyone who arrives, which is true, but doesn't state that we have no right to refuse any EU nationals entry, as is the case. I've already covered how the Government's renegotiation is a sham and not legally binding so I won't flog that particular deceased equine any more. What can be said however, is that the restriction to in work benefits for EU migrants is such a minor issue that I genuinely can't think of single person, including the most Kippery of Ukippers mentioning it before Cameron made it the flagship goal of his pitiful new deal. As has been well documented, immigration into this country, leaving aside the social aspects for the moment, has been of huge benefit. Migrants take out far less than they put into the system. Moreover, the stronger UK economy and (now even higher) minimum wage act as infinitely stronger pull factors than any in-work benefits migrants may or may not be eligible for. What the 'greater powers to take action where there is abuse of our immigration system' are, I'll be damned if I know. It takes the, hotly contested title, of most unqualified statement within the leaflet. The European Arrest Warrant is a spectacularly illiberal piece of legislation, allowing for the deportation and imprisonment of citizens without due process. Take the story of Andrew Symeou for example, wrongly extradited to Greece on suspicion of murder to spend a year in a maximum security prison before being cleared of all charges. You can read a more detailed explanation of the problems with the EAW here. Moreover, this fails to acknowledge the role Interpol plays in the cross-border policing of crime. There's also a conspicuous absence of any mention of cross border intelligence sharing. This is presumably due to the ineffectiveness of the EU's own intelligence service, and the important role that non-EU institutions such as the Five Eyes intelligence sharing service has played in countering international terrorism. There's also no mention of the role NATO has played in securing peace on the continent, something else often falsely attributed to the EU. The EU's freedom of movement rules have also been criticised for facilitating terrorism on the continent. "The UK is part of the EU, a group of 28 countries which exists to promote economic security, peace and stability. The EU operates as a single, free-trading market, without taxes between borders. The UK has secured a special status in the EU. The UK has kept the pound, will not join the euro and has kept control of UK borders. We have ensured that no UK powers can be transferred to the EU in the future without a referendum. The UK will keep full access to the Single Market, with a say on its rules. For every £1 paid in tax, a little over 1p goes to the EU. The Government judges that what the UK gets back in opportunities, job creation and economic security from EU membership far outweighs the cost. EU membership means you and your family have the right to live, work or study abroad in any of the 27 other member countries. It also guarantees many employment rights. The UK is a strong, independent nation. Our EU membership magnifies the UK's ability to get its way on the issues we care about. EU action helped prevent Iran from obtaining nuclear weapons; and the EU is leading the world on tackling climate change." Once again we are given the 'special status' myth as well as the disingenuous statement of controlling our borders. We have indeed kept the pound, going against the advice of many of the same people who are currently advocating for our continued EU membership. As I've mentioned, taking the EFTA/EEA route out of the EU ensures we maintain full access to the single market, giving us a say over EEA rules, a right of reservation on the implementation of those rules, and crucially, a say in the formation of those rules at the global level before the EU sets about implementing them. As for cost Norway's EEA grants and so on amount to £134 per head per annum. The UK figure is £252, meaning the EFTA/EEA route offers the same benefits whilst potentially offering a substantial saving in fees. The freedom of movement of UK citizens would also be maintained by the Flexit model. Employment rights, like many, many others, are guaranteed by a plethora of ILO conventions to which the UK is a signatory. This is yet another example of regulations being made at the global, not EU, level. The UK is indeed a strong nation, we're the 5th largest economy in the world, the 4th military power, a member of the G7 and G20, a member of NATO, a nuclear power, and one of 5 permanent seat holders on the UN Security Council. It is because of this strength that those who wish for us to leave the EU believe we will be more than capable of conducting ourselves satisfactorily on the world stage. The assertion that we are currently independent though, would be hilarious if it weren't so risible. The fact Cameron had to go around Europe with a begging bowl in an attempt to secure his measly reforms puts that idea to bed. We have outsourced our trade policy to the European Commission and, far from having our influence magnified, are increasingly marginalised at the global level because of that. "The referendum on Thursday, 23rd June is your chance to decide if we should remain in or leave the European Union. This is the way to protect jobs, provide security, and strengthen the UK's economy for every family in this country - a clear path into the future, in contrast to the uncertainty of leaving. If you're aged 18 or over by 23rd June and are entitled to vote, this is your chance to decide. Registration ends on 7th June. Find out how to register at Aboutmyvote.co.uk and register online at Gov.uk/register-to-vote"
The Eurozone is stagnating and if Greece and Italy's woes continue, could well be plunged back into recession. Schengen, the migrant crisis, and the spread of ISIS has rendered Europe less secure than it has been in decades. The UK economy is best strengthened by turning our heads towards emerging global markets rather than remaining fixated on an economy that is the same size now as it was in 2006. There is indeed a clear path into the future of our EU membership, as set out in the Five President's report. This report sets the tone for the next stage of EU integration, aiming for "deeper integration of national labour markets", "coordination of social security systems", and harmonising "insolvency law", "company law" and "property rights". Despite being rubbished as a 'dangerous fantasy' by Nick Clegg just two years ago, there are now open calls for a combined EU army and foreign policy. A vote to remain is not a vote for the status quo but to continue along the path of further political integration. The UK will be much better served by forging her own path, co-operating with her neighbours and allies on the continent, but not bound to the goal of a federal Europe. Remaining is the far riskier option.